Improved weather conditions during the past week have allowed us to make some good progress at the High Pastures site, and to recover some new artefacts. Read on for more details. During the excavation of the Trench 2 extension over the past week, we have recovered two new artefacts. A large piece of ironworking slag was found to the side of an hearth setting, within intricate lenses of peat ash and charcoal-rich sediments. 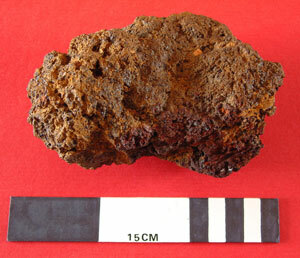 The slag deposit which weighs over 0.75kgs will be analysed by specialists later this year. However, along with other finds made at the High Pastures site, it would seem that metalworking is taking place somewhere nearby. In a lens of dark, charcoal-rich sediment, immediately to the north of feature F210 (hearth setting), we recovered a fine polished bone pin. 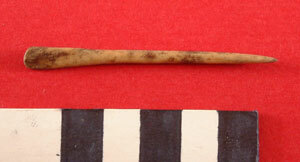 Possibly manufactured from deer antler, the pin has a small spatula on the opposite end. This was a nice find to make, from an unusual location in the trench, and is the first bone pin of such quality to be recovered from the site so far.